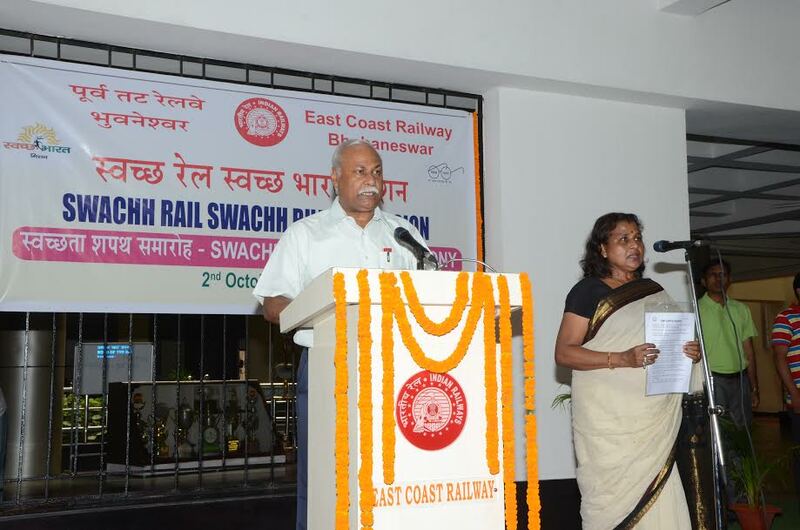 East Coast Railway has taken various activities like Intensive Cleanliness & Sanitation Drive at different Railway establishments especially Railway Stations, offices and Railway colonies followed by oath taking on Sunday in the day of Gandhi Jayanti to mark the observance of completion of two years of Swachh Bharat Mission and beginning of third year. Shri Umesh Singh, General Manager, East Coast Railway administered oath to the Staff & Officers of Railways at East Coast Railway Headquarters, Rail Sadan, Chandrasekharpur, Bhubaneswar to remain committed towards cleanliness & devote time for this; to devote 100 hours per year i.e. two hours per week; not to litter or let others to litter; initiate the quest for cleanliness with self, family, locality, village & work place; propagate the message of swachh Bharat Mission in villages & Towns etc. Additional General Manager, Shri B. N. Mahapatra and Chief Personnel Officer Smt. Manju Ray were present on the occasion. Staff & Officers of Railways led by General Manager Shri Umesh Singh made Shramdan for Cleanliness at Rail Vihar Colony and planted saplings on this occasion.